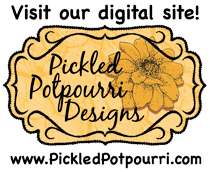 Happy Thursday! 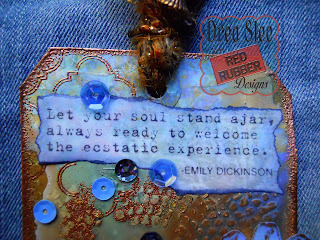 This week I have a mixed media tag to share with you, featuring the Mini Medallions Cling Mounted Rubber Stamp, and the Medallions, For Everything, and Be Happiness Unmounted Rubber Stamps from Red Rubber Designs! 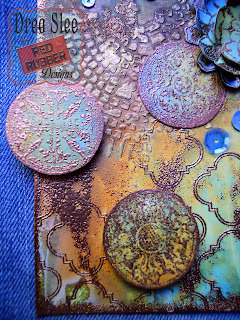 I started with white gesso that I coated a Ranger Manila Tag with, and to the TCW stencil in the center. 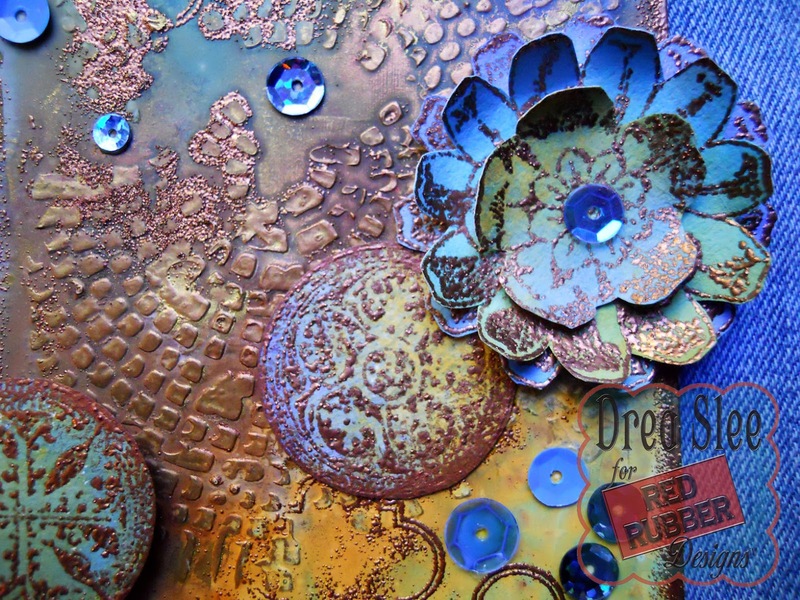 Once dry, I used Broken China, Blueprint Sketch, Wild Honey, and Vintage Photo Distress Spray Stains with a light spritz of water on my tag, and on a separate sheet of white cardstock for the medallions. 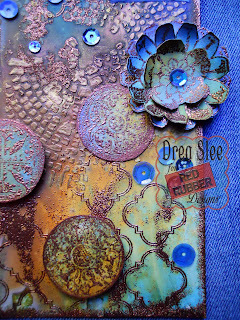 When that dried, I re-applied my stencil to the tag to add Prima's Metallique Wax (Vintage Gold and Rich Copper) over the gesso. Then I embossed the design along the top and bottom in copper with the For Everything Unmounted Stamp. 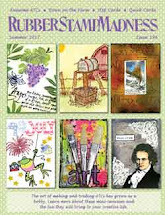 Using the cardstock that I previously sprayed, I embossed the Medallions Stamp onto it, fussy-cutting, and layering it three times to make a flower. I used three of the Mini Medallions, also embossed in copper, and popped two of them up with foam dots. 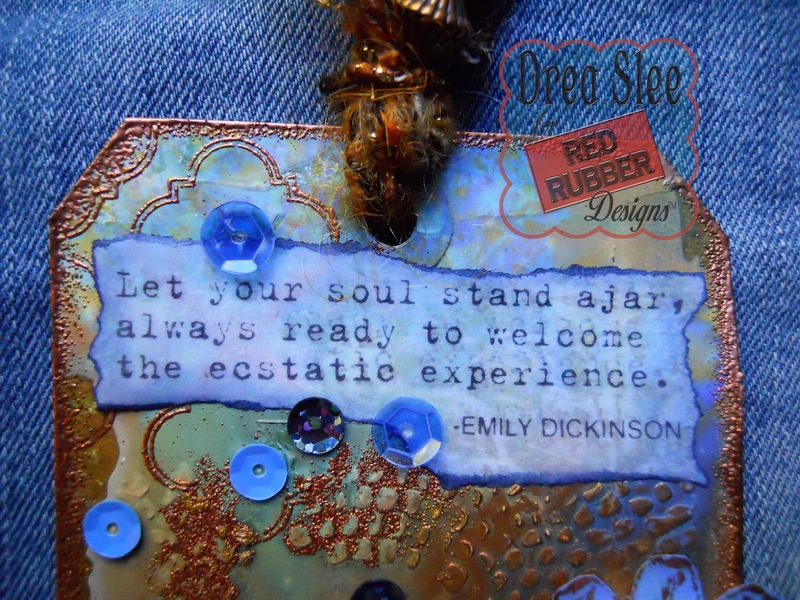 The phrase was stamped in black with the Be Happiness Unmounted Rubber Stamp onto a piece of torn vellum inked along the edges with Chipped Sapphire Distress Ink. Then I scattered and glued some blue sequins along the tag. 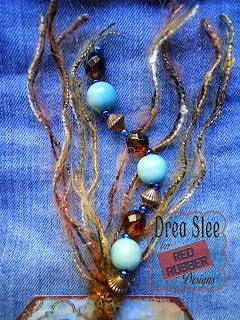 I finished off the top with some fibers and beads that I strung together. 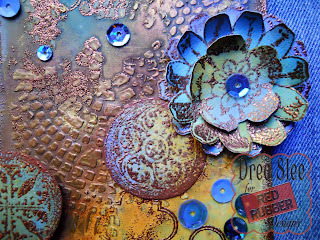 The result is this fun tag with copper accents and a bohemian vibe!